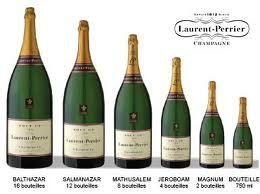 Awesome big champagne and wine bottles: What’re their names? Wine may go back many millennia to Bronze Age times, but the wine bottle as we know it today is only about three centuries old. It was only the development of the cork-stoppered, cylindrical glass bottle – which could be stacked on its side, keeping the cork airtight and wet – that permitted the development of ageworthy wines that improve with cellaring. The “fifth” bottle, originally one-fifth of a gallon, now rounded off metrically to 750 ml., was said to be a suitable ration for one man with dinner, back in the days when men were men (and most wine was quite low in alcoholic strength). One theory holds that this size bottle was actually the largest that early glass-blowers could produce with one full breath.